Today's post is written by the lovely Sarah from Some Sparkle and Shine. She is going to be talking about her top five products for dry skin! So, a little introduction seems to be in order right now. Well, I’m Sarah and I blog over at somesparkleandshine.blogspot.com. You can also find me on twitter here! A few facts that you may want to know about me might include the fact that I have major social anxiety, I’m obsessed with shopping and I have enough lipsticks to last my life time (and that’s really not that much of an exaggeration! It’s quite shameful). I debated a number of topics for this post, before finally settling on writing a little something about skincare. 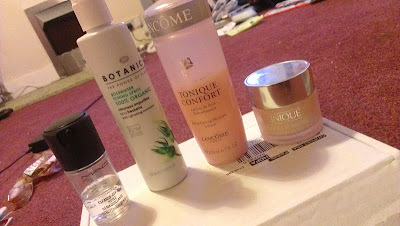 Essentially, this is a list of my top 5 skincare products for dry skin. Now, I claim to be no expert! In fact, until recently I didn’t even get the importance of having a good skincare regime was to my skin, but after settling on a routine I wanted to share some products that really helped me out. I have always suffered with dry skin, and it’s not until recently that I settled into a routine for my skin that I finally have it under control. Over the years, I’ve tried something from nearly every range at the drugstore, and a few higher end bits too. But, here are my top 5 products for people with very dry skin. This is my miracle product. I’ve tried so many different makeup removers and this is by far the best for two reasons. The first is that it dissolves all makeup almost instantly. It takes one quick swipe of this on a cotton pad and all is gone. The second is because it’s an oil, meaning it injects a little more moisture into the skin than something water based! Everyone seems to be raving about this for one reason or another, and I’m really no different. I don’t really use this as toner, but more as a refresher for my makeup. I find that with my dry skin foundation can look dull after a while, no matter what the formula and I find that it tends to cling to all those nasty dry patches. That’s not such an attractive look, so I remedy that with a spritz of this all over my face. It brightens my makeup up, and leaves me feeling refreshed. I have only really just started using toners because I’ve never really seen the point in them, but now I’ve started using this I won’t turn back. I’m not entirely sure what it does as a toner, but this makes my skin feel amazing. It’s just that extra bit of moisture that my skin needs first thing in the morning and last thing at night. This is something that I brought ages ago and never really gave it the time of day. It was really cheap, and somewhat of an impulse buy. I used it once, and stashed it away for an unknown point in time. I had actually forgotten about it until I sorted through my stash of skincare a week or so ago. I now couldn’t go without. I used it morning and night under my moisturiser, and it’s brilliant. It hydrates my skin, and I feel that since I’ve been using it my makeup lasts that little bit longer! That’s a win, win situation right there. I have recently run out of this, but as soon as I can get out into Superdrug I will repurchase this without even thinking about it. I cannot say enough about this! I mean that in all honesty. I cannot find one bad thing about this product, except maybe the price but when it’s a good as it is I think I can justify paying out for it every now and then. I’ve tried two other Clinique moisturisers, and none of them even compare to this bad boy. It works wonders for my skin. It injects so much moisture into my skin, it has a lovely cooling effect because it’s a ‘cream-gel’ formula and if I’m having any breakouts or anything like that it doesn’t make them any worse. Some moisturisers for dry skin can make breakouts worse, and even spread them a little, but this doesn’t do anything like that. I hope some of these products can help out your dry skin, and don’t forget to comment if you have any miracle products for your skin that you just have to shout about! Sarah has such a nice blog which I love reading! You can check it out here. Thankyou for commenting on my blog and being interested in guest posting for me! :) if you could please comment again as silly blogger decided to delete that post and lost your email address! Really nice!!! !the Beauty Product Reviews are really beneficial to choose the best product.